Jewel of the Arts slot machine is an incredible 5-reel, 20-payline game from IGT boasting a number of enriched features like wilds, free spins and multipliers. In this game you'll experience the art, grace, and beauty that surround the Geisha. Enjoy the artistry of the Fan Dance Bonus as the Geisha elegantly presents locked wild reels, perfectly designed to always provide multiple wins. 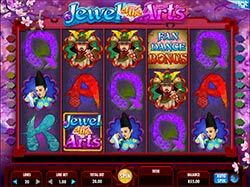 Jewel of the Arts slot machine is an incredible 5-reel, 20-payline game from IGT boasting a number of enriched features like wilds, free spins and multipliers. In this game you’ll experience the art, grace, and beauty that surround the Geisha. Enjoy the artistry of the Fan Dance Bonus as the Geisha elegantly presents locked wild reels, perfectly designed to always provide multiple wins. This beautiful slot is painted on a gorgeous purple and pink Japanese looking background with lily petals floating around the edges of the slot casing. On the reels you’ll find origami swans, samurai warriors, Geisha actors, a paper fan, a Fan Dance bonus symbol, the Jewel of the Arts game logo and card symbols jack through ace. Even the music is pleasant, setting a great mood with a traditional but modern Japanese sound. Fan Dance Bonus – Land three Fan Dance Bonus symbols anywhere on the reels on the center three base game eels and win three free spins in the Fan Dance Bonus. The Fan Dance Bonus features locked wild reels and stacked symbols. The Bonus starts with reel 2 entirely wild. Next, reel 3 also becomes entirely wild. Finally, reel 4 becomes wild making all three center reels entirely wild! Extra Spin Symbol – During the Fan Dance Bonus the Extra Spin symbol can appear on the first reel and if it does, another spin with the same locked wild reels will be awarded! Geisha Wilds – The Geisha symbol is the wild and substitutes for all symbols except the Fan Dance Symbol to complete winning combinations when possible. Bonus Scatters – Land exactly 2 bonus symbols on the center three reels and you’ll win 2x the total bet!